The Cambria Green Specific Area Plan and Masterplan is one of the largest planning scheme amendments and tourism developments ever proposed for the East Coast of Tasmania. The Cambria Green zoning amendments and development have the potential to change forever the social, cultural and environmental characteristics of the entire East Coast, not just Swansea, Dolphin Sands and Cambria. The East Coast Alliance is committed to protecting the values that make Tasmania such a special place to live and visit. The extent of the Cambria Green amendment proposal and its proximity to Swansea, Cambria and Dolphin Sands. Commissioned by Sophie Underwood. If approved by the Tasmanian Planning Commission, and provided the developers work within the new SAP rezoning, the Glamorgan Spring Bay Council will have LIMITED RIGHT OF REFUSAL to any development application (DA). Remember – the Masterplan Concept currently grabbing all the headlines is just that – a concept. No DA has been submitted. The developers have NO obligation to implement the concept Masterplan. 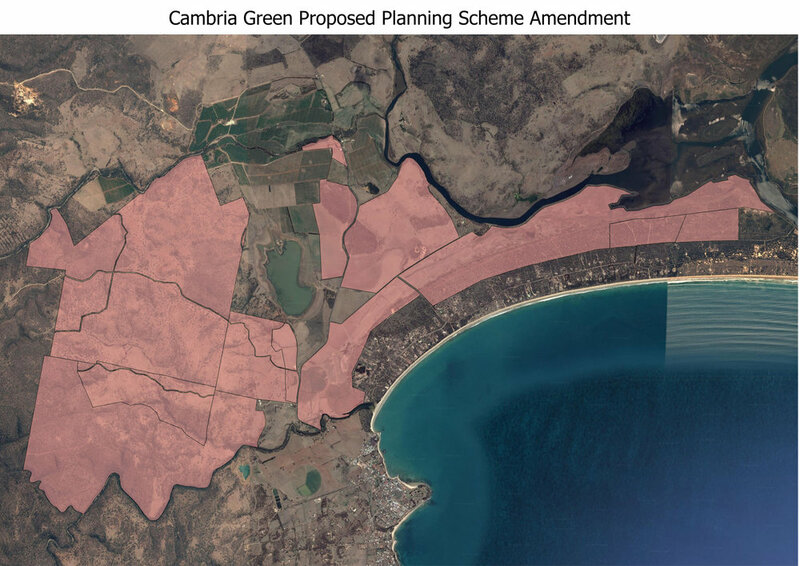 The Cambria Estate Draft Amendment AM 2018-03 (Specific Area Plan and other amendments) was initiated by Glamorgan Spring Bay Council (GSBC) on 24 April 2018. At this meeting, the Council could have voted “NO” to the proposed Draft Amendment. Click here for a useful diagram outlining the approval process for amendment of planning schemes (Part 3, Land Use Planning and Approvals Act 1993). Submissions to Council closed on 14 June. A total of 623 submissions were received by Glamorgan Spring Bay Council, around 98% of these were AGAINST the Cambria Draft Amendment, and many of these were detailed, informed representations from individuals and significant state and national organisations. The GSBC planning department processed and evaluated all submissions to prepare a Section 39 Report. Council was granted two extensions to complete the Report (to 30 November 2018). The Section 39 Report was presented to Councillors at the 27 November 2018 meeting for consideration and voting. The Draft Amendment was approved 4 to 3. Watch a live recording of the meeting here (Cambria starts at 44 minutes). The Section 39 Report and all submissions were forwarded to the Tasmanian Planning Commission (TPC) and are available for public viewing on the Tasmanian Planning Commission website. The final decision on the Cambria Draft Amendment is the responsibility of the Tasmanian Planning Commission, not the Glamorgan Spring Bay Council. A public Directions Hearing was held by the Tasmanian Planning Commission on Friday 14 December at the Swansea Town Hall to assess the key issues, set process and determine what needs to be done for the final hearing. The panel of three Commissioners acknowledged the significant number of concerns and issues about the Cambria Draft Amendment raised by representors in their submissions. Other issues raised by those in attendance and acknowledged as legitimate concerns by the Commission included ground water; the airstrip; jurisdiction around the property purchase and company documents. The potential social and economic impacts of the proposed development were cited as a key concern. The Commission panel noted the current lack of detail from the proponents meant many concerns relating directly to the potential development could not be adequately assessed. The Commission panel gave the Cambria Green applicants (proponents) until 1 February 2019 to file a response to the Section 39 Report, provide any further submissions and expert proofs. The Commission Chair stated no further evidence would be received after 1 February and before the full hearings. As outlined above, following the (TPC) Directions Hearing the Cambria Draft Amendment proponents were given a further six weeks (until 1 February 2019) to file a final response to the Glamorgan Spring Bay Council’s Section 39 Report, the 600-plus submissions received by Council, and to provide other proof of evidence and expert reports on a range of issues of concern to the TPC. On 4 February the proponents requested, and were granted by the TPC, a further extension to Friday 8 March 2019. Read here the relevant correspondence from the TPC Panel (under Hearings). Note: to follow the process and access all relevant documents relating to Cambria on the TPC’s Iplan website, click here. When all the original documents and submissions are downloaded (you may need to be patient), click on the Hearings tab to take you to the most recent TPC correspondence and further submissions. The TPC received on Friday 8 March, through planners IreneInc, most of the requested further evidence from the proponents - click here to access. The TPC then directed the proponents to provide the missing jurisdictional information relating to titles and landowner consents by Friday 29 March. The TPC has now stated it will assess these jurisdictional issues first. All parties have until 30 April to provide submissions relating to - and only to - these jurisdictional issues. If you would like to make a further submission, please forward by email to tpc@planning.tas.gov.au. After 30 April, and following assessment by the Commission Panel of the jurisdictional issues and related submissions, the Panel will set dates for further representations relating to the proponent’s 8 March submission. All representors will be informed of key dates, including dates of the public hearings when known. The East Coast Alliance was formed by a small group of community volunteers concerned about the potential impacts of the Cambria Green Specific Area Plan and Masterplan. The ECA is not opposed to, and supports, appropriate, reasonable and sustainable development. The East Coast Alliance Executive Committee members are Anne Held (President), Steve Barrett (Vice President), Jennie Churchill (Secretary/Public Officer), Marjorie Howard (Treasurer), Mitty Williams (Committee Member), Maureen Stevenson (Committee Member). We welcome and value strong partnerships. The ECA is already working with other statewide groups and organisations focused on protecting the unique characteristics of East Coast Tasmanian communities. Please contact us at ecatassie@gmail.com should you or your organisation wish to become involved.